Strong corporate profits, a healthy global economy, and the absence of major geopolitical issues in the third quarter resulted in developed stock market gains. For the quarter, U.S. stocks (as measured by the S&P 500 Index) advanced 7.7%, and non-U.S. developed market stocks (as measured by the MSCI World Ex U.S.) advanced 1.3%. Emerging market stocks (as measured by the MSCI Emerging Markets Index) declined -1.1% as stocks in China and Turkey struggled during the quarter. As widely anticipated, the Federal Reserve increased its key policy rate by 0.25% in September. The new benchmark target rate is 2.00-2.25%, and that is the eighth rate-hike since December 2015. The Federal Reserve indicated that it is also targeting one additional interest rate increase this year. For the quarter, the 2-Year Treasury rose 0.29% to 2.81%, while the 10-Year Treasury advanced 0.20% to end at 3.05%. This is the highest quarter-end level for the 2-year Treasury since 2007, and the highest quarter-end level for the 10-year Treasury since 2011. The U.S. Dollar Index, a measure of the value of the United States dollar relative to a basket of foreign currencies, advanced slightly in the third quarter — with the U.S. dollar appreciating by 0.15% compared to foreign currencies. The U.S. dollar is now 2.28% higher than it was 12 months ago. Economic growth in the U.S. picked up in the second quarter. The final reading from second quarter GDP showed an increase in economic growth of 4.2%. The September 2018 reading of the unemployment rate was a very low 3.7%, and the tighter labor market has been pushing wages higher. For the 12-months ending September 2018, average hourly earnings are up 2.8%. Domestic inflation remains tame as the Fed’s preferred gauge of overall inflation, the core Personal Consumption Expenditures (PCE) index, reached the Fed’s target of 2.0% in May 2018 and has remained there since. U.S. Large-Cap stocks advanced the most during a quarter where all the U.S. stock indexes we track posted positive results. 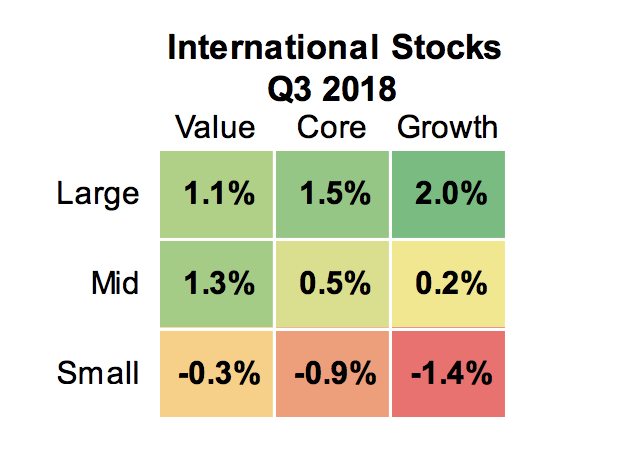 International Value Stocks and Emerging Markets Value stocks posted reasonable gains while International Small-Cap Stocks slightly declined. Focusing on Emerging Markets, we referenced earlier that the broad Emerging Markets stock index was down, but here we show that Emerging Markets Value stocks were positive. The main difference in the results was from China. Chinese value stocks performed well during the quarter, where as Chinese growth stocks had a very bad quarter. Bond yields rose across the maturity curve during the quarter, which typically sends current bond prices lower. However, interest earned from the bonds was enough to offset any price declines from rising rates. In the U.S., large-cap stocks outperformed mid- and small-cap stocks in all style categories. Among the nine style boxes, Large Growth posted the largest gain of 9.2% for the quarter, and Small Value posted the smallest gain of 1.6% for the quarter. In developed international markets, stocks had mixed results. Large-cap and mid-cap stocks all outperformed small-cap stocks for the quarter. Value performed better than growth in mid- and small-cap stocks, and growth performed better than value among large-cap stocks. With stocks advancing globally, a diversified index mix of 65% stocks and 35% bonds would have gained 2.6% during the third quarter.